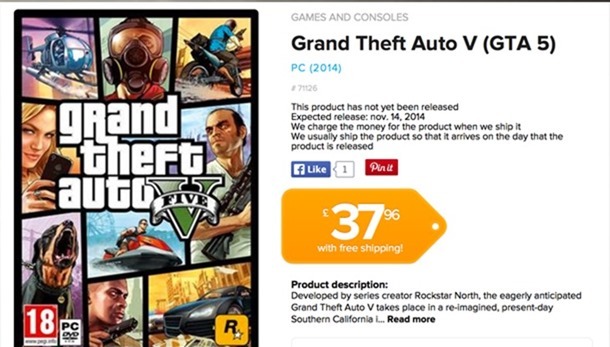 As always with these retail leaks we need to take them all with a pinch of salt but a European online retailer has possibly leaked the release date for the next gen versions of Grand Theft Auto V.
PCFormat are reporting that retailer Coolshop are now taking pre-orders for the PC version of Grand Theft Auto V with an expected release date of the 14th of November. This could easily have been a placeholder date but what makes it seem more likely now is that if you head to the same site now you will see they’ve updated the listing and given it a 31st of December release date. People are also pointing out that the 14th is a Friday and saying that games are normally released on a Tuesday. However if you’re not American you would also know that Friday is actually the normal release day across the planet so this actually points more towards this being a correct release date I‘m personally looking forward to seeing how well the game runs on a top end PC and could possibly play through it again but definitely not this year. October and November are hectic enough already without throwing in another massive title. However for those who have been holding out for the PC version this is good news for you. Christmas holidays are now sorted and you can finally understand the insanity that is Trevor’s mind.